Let’s discuss leaky gut and then we’ll go over what you need to do testing wise to get this looked at. Think of the individual cells that make up the lining of your intestines as locked together. It’s like your thumbs locked with your palms out and your fingers up in the air. Your fingers would be the villi that project inside the intestines to grab tiny food particles as they pass through the digestive system. As these particles move through the intestines, enzymes break them down into smaller and smaller particles until eventually the villi pull them through the cells through the submucosa, into our blood stream and we get nutrition into our body. There’re some bad things that can happen however. 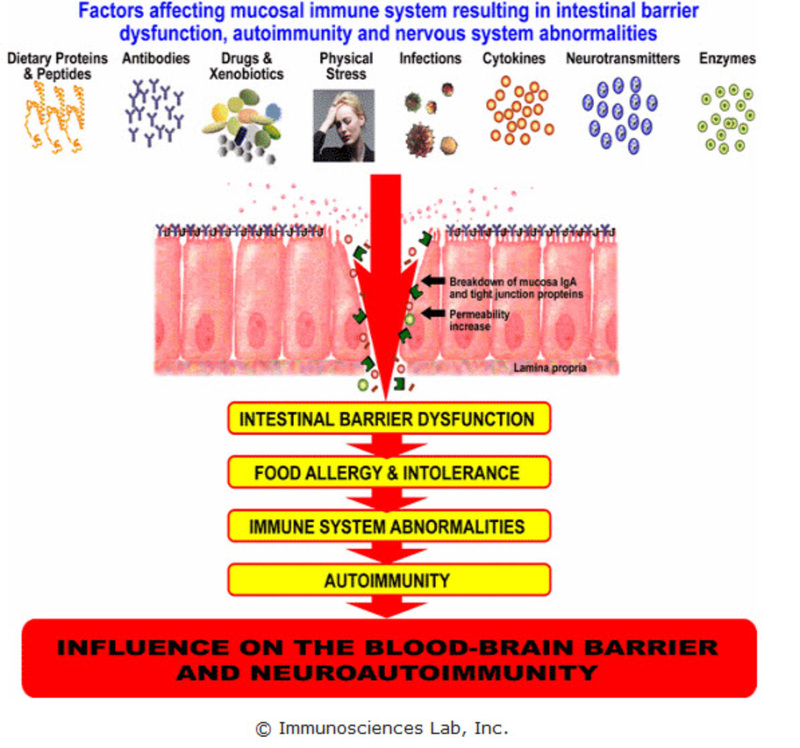 We can have food sensitivity, a bacterial over-growth, a parasite, etc. What can happen from that is that those tight junctions open up like little elevator doors opening up, leaving a gap between the cells. This allows large dietary proteins to leak through e.g. ‘leaky gut’. What do you think happens when this large particle gets through into your bloodstream? Your immune system attacks. Like a pac-man, it gobbles it up. But your immune system reacts as if it doesn’t know if it’s just this one ‘invader’ or a whole army. It just takes a sketch of it and sends out the message so everyone else is on the lookout. What happens in people with autoimmune conditions is that the body will attack other tissue as well, almost like an innocent bystander in a drive by shooting. We call this molecular mimicry. In the case of Hashimoto’s, immune cells hanging out near the thyroid start attacking the thyroid whenever they get the message that an invader has come over the wall. Stored in the thyroid is T3 and T4 and when it’s attacked, those thyroid hormones are dumped into the bloodstream. It’s the workers dumping widgets galore onto the truck and the manager backing seeing there’s plenty and decreasing TSH. But then the attack will pass and TSH will come up to normal again. Eventually the thyroid will begin to be destroyed and the TSH may show in your blood as a bit high. This deterioration will continue until your thyroid is so damaged that you show high TSH and they diagnose you as hypothyroidism. This is when the doctor may prescribe synthetic T4. Meanwhile, your thyroid continues to be attacked from this autoimmune process and your levels will continue to fluctuate and symptoms will persist. If you notice that your doctor is continuing to have a hard time regulating your meds for your condition, there’s a good chance that you have Hashimoto’s. Again, the thyroid is the target of the attack and is not the problem. There are 95 different tissue types in your body and any can be targets of autoimmune processes. There a condition called polyautoimmunity where multiple tissues are attacked through the same process. Often times we see pernicious anemia going along with Hashimoto’s, for example. So what do you do now that you know that TSH and T4 are not nearly enough? You have to look at the whole web. There are three tests that we’ll primarily run in our office. The first one is a comprehensive bloodwork panel with over 70 markers. We’re going to look at all the thyroid markers, insulin, inflammation, RBC’s, WBC’s, etc. It’s a huge panel. We like to look at the adrenals and hormones with a separate test measuring your cortisol pattern. We also check for leaky gut and food sensitivity with certain tests. To start off, there’s typically just blood work. When you come in for your first visit, we’ll sit down with you after you’ve filled in a few questionnaires; we’re going to build a physiological web of dysfunction specifically tailored to you. There’s nothing cookie cutter for this work. Every single patient is an individual. We’re going to sit down and figure out what your web is, especially outside the TSH/T4 window. Learn more about how thyroid disorders and leaky gut are connected by following this link.